Fits motorcycles with 7/8" handlebars. This grip is 5-3/16" long. MULTI-PURPOSE GRIP: This dealer preferred grip fits both motorcycles with 7/8" handlebars or any ATV. Packaged with sleeves to downsize the grip's 1.00" ID to 7/8" - one set of grips satisfies the needs of any ATV owner or motorcycle owners with 7/8" handlebars. Patented Burn-out Proof heating elements. CUSTOM OPTIONS - all our grips come stock with a three position (high,low, off) weatherproof toggle switch. 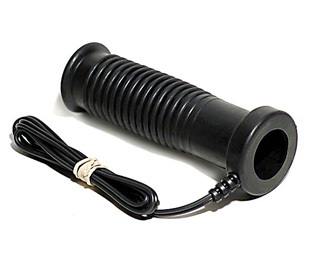 Optionally you can substitute a handlebar mounted switch,�mini toggle switch or infinitely variable heat controller. Handlebar Diameter: 7/8" motorcycle, 7/8" or 1" ATV with thumb throttle. Inside Diameter: 1.00 but 2 sleeves�included to convert to 7/8" i.d.